In addition to our plants in Hamburg and St. Egidien/Saxony, in 2006 we opened our third subsidiary in Germany in Altenburg/Thuringia. 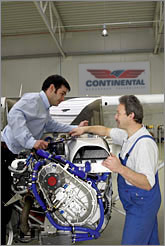 All in all, the Thielert Aircraft Engines engages more than 200 employees at this three locations. On the following site, you will find interesting job offers. Take a look. Maybe you will find the position that suits you. Do you have questions about the career opportunities of Thielert Aircraft Engines or about our published job offers? Please don’t hesitate to contact our staff department.